Needles are probably one of the earliest tools used by man and have remain largely unchanged in design although a variety of different materials have been used from bone and thorns to wood and wrought iron. Since the 15th century needles have been made from steel because this was metal was stronger, more resilient and had a much longer life. Making needles was a very long job with a number of stages from cutting the steel and boiling the needles to creating the eyes and polishing them. Those employed in needle factories worked very long hours. 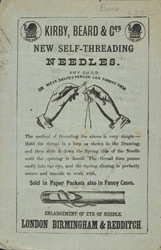 The company advertising on this leaflet, Kirby, Beard & Co had speciality pin and needle shops in London and Paris.